Cameroon is engaged in the export of oil and oil products, timber, cocoa, coffee, and cotton. Among the partners in foreign trade are Spain, Italy, France, the United States, the Netherlands, and China. Cameroon also imports goods from Nigeria, Belgium, France, and China. GoAntiFraud supports EjoinTech gateways and SIM banks! By connecting to our service, you will increase productivity of your equipment tenfold. Thanks to efficient tools to protect against AntiFraud systems, you reduce your business expenses on purchasing new SIM-cards. We recommend using SIM-cards of the largest operator in Cameroon - MTN, so that you can get a steady income from the termination of calls. Orange packages will also do to terminate traffic. It should be noted that GSM coverage in small towns is not too good, which makes mobile communication unstable in such settlements. 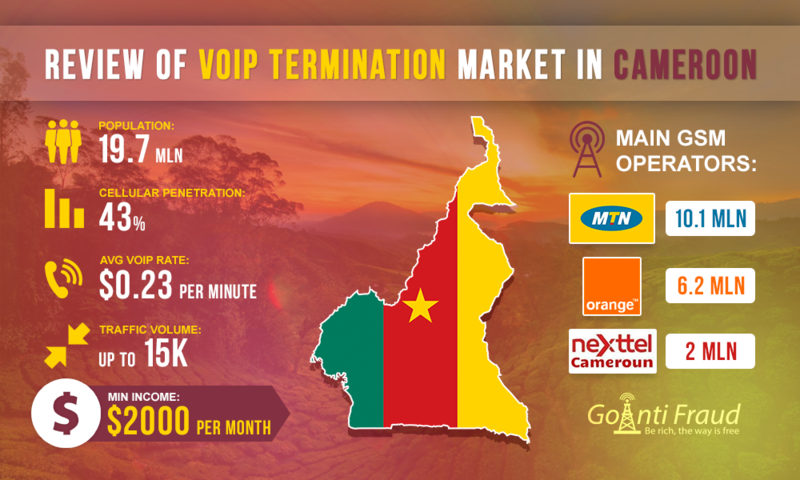 Average voip rate in Cameroon is $0.23 per minute. One minute of a local call will cost about $0.1, which opens up good prospects for the owner of an elastix gsm gateway to make good money. Terminating for 5 hours a day via a 16-channel device, you can make over 10 thousand dollars a month, if you provide protection of SIM-cards from blocking by antifraud systems, of course. You can read here about the selection of the most favorable packages for traffic termination GoIP in Cameroon. To minimize the number of cards blocked by AntiFraud analytical systems, you should use efficient tools for simulating human behavior. GoAntiFraud is a complete solution that allows you to disguise from the mobile operators and prevent the SIM-block. By connecting to our service, you can significantly increase your profits and reduce costs to purchase new cards.